By using robotics to replicate the calf muscles and Achilles tendon, the iWalk BiOM feels and functions like no other foot/ankle prosthesis. With each step, the iWalk BiOM provides a powered push-off which propels the wearer forward. It is the only prosthesis in the world that does not depend on the wearer’s energy. With the iWalk BiOM, users will experience natural walking mechanics and increased stability, mobility, and confidence. 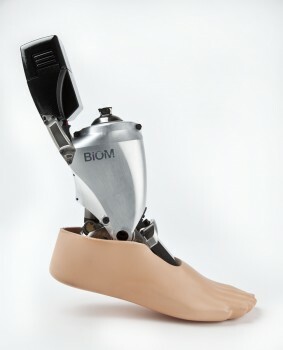 The iWalk BiOM affords amputees to walk with natural energy. Unlike other prosthetics, the iWalk BiOM requires less energy and walks with greater ease. The Mobility with the iWalk BiOM requires the same metabolic energy used by non-amputees which will also provide more power for you to walk faster. Patients will no longer feel like their prosthetic is holding them back. 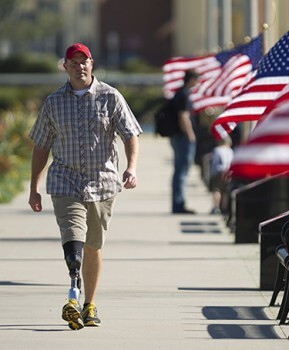 It delivers a natural gait at variable speeds like other prostheses have never been able to achieve. Amputees will feel a greater stability with the iWalk BiOM. Users are able to negotiate stairs and inclines with increased confidence and stability due to improved articulation and the design’s ability to mechanically yield and conform.